Merry (almost) Christmas Everyone!!! Can you tell I'm just a liiiittle excited for the month of December!? Christmas is absolutely my most favorite holiday, and each year I get so anxious for December to creep closer and closer so that I can start decorating! Last year I started in October (yes, that was a little on the crazy side)... so this year I waited till mid November. That's good enough, right? ha! Also last year we were out of town for the holidays so we didn't have the opportunity to put up a tree or really decorate all that much, except for our ever-changing kitchen shelf vignette area. We also didn't use any red color in our decorating. Not because we didn't like it... but because I wanted to try something a bit different! I really liked stepping outside the box, but this year... 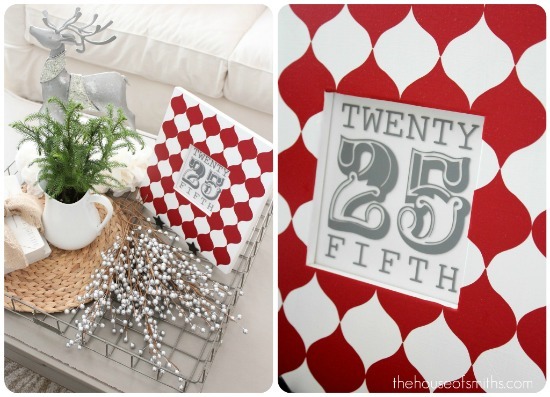 I was itching to use reds ALL OVER my home! I also had a goal in mind, to work in some trendy patters and colors that we already loved, to make this years Christmas... traditional, with a twist of modern. Perfect for our home! 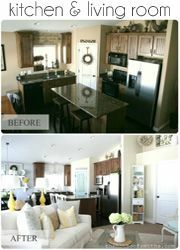 Here are some photos below and info on how we did it! Originally I had thought I might make stockings this year, but then I found these simple natural colored ones at Tai Pan for only a few dollars each! So instead, I just bought these little glittery initial tag hangers from Pottery Barn and then attached some small snow-dusted pine cones to them, to give the stockings a simple, classy touch. One of my favorite DIY pieces is this chunky square frame that I made. I love the bold statement it makes in the room. 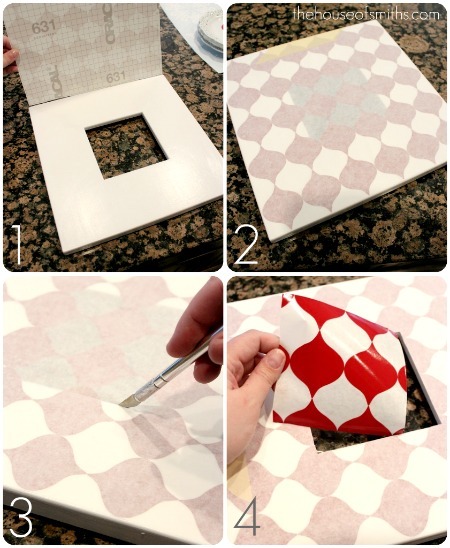 I started out with one of the DIY Frames, (that we now sell in our shop) painted it white, added this red trend vinyl decal over the top, used an exacto knife to cut out the vinyl where the non-glare plexiglass goes. Then I adhered the 25, dark grey decal to the plexi, and that was it! You can purchase this whole kit or just parts of it, in our Design Shop HERE. So you know me and pillows right? I'm a lot obsessed with great pillows. ha! Normally I try to make or find all of my pillows on sale, but when I saw this Celebrate pillow from Pottery Barn I knew I HAD to have it! And the large yellow bird pillow was on sale at Bijou Market this past Saturday at The Sewing Nerd's booth for a fabulous price, so I snagged that too. And I'm SO glad I did, because it really ties in all the other yellow in the room that we have going on! The cute red pillows I DID make though. I looked everywhere for the PERFECT red pillows, but couldn't find them. 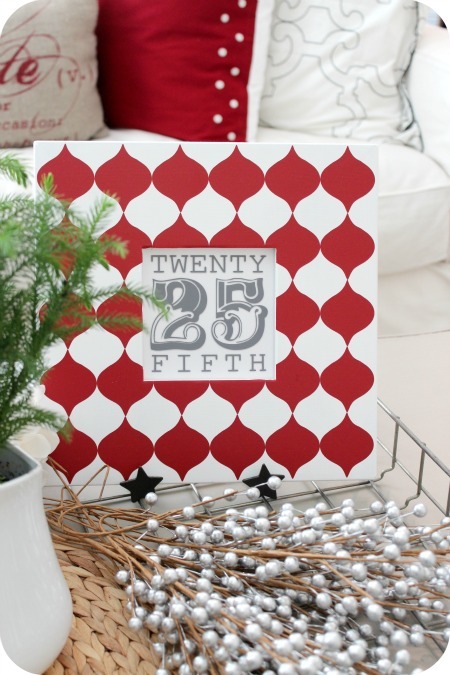 Until I went to Pottery Barn and found these adorable red and white polka dot dinner napkins! They were only $7.50 each and so I just used some inexpensive white cotton fabric to sew up an envelope backing on each napkin, and wa-la! 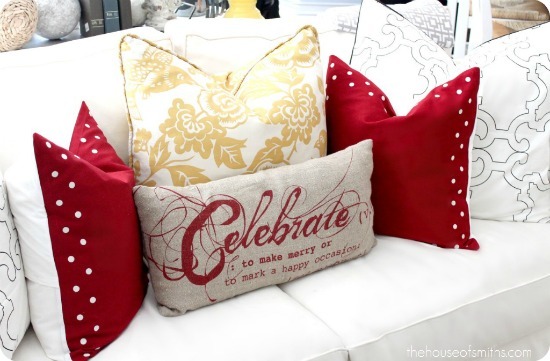 You have the perfect red pillows! Like I said, touches of red are everywhere this year. From the wooden beads strung on our tree, to the pretty red poinsettias that we used. 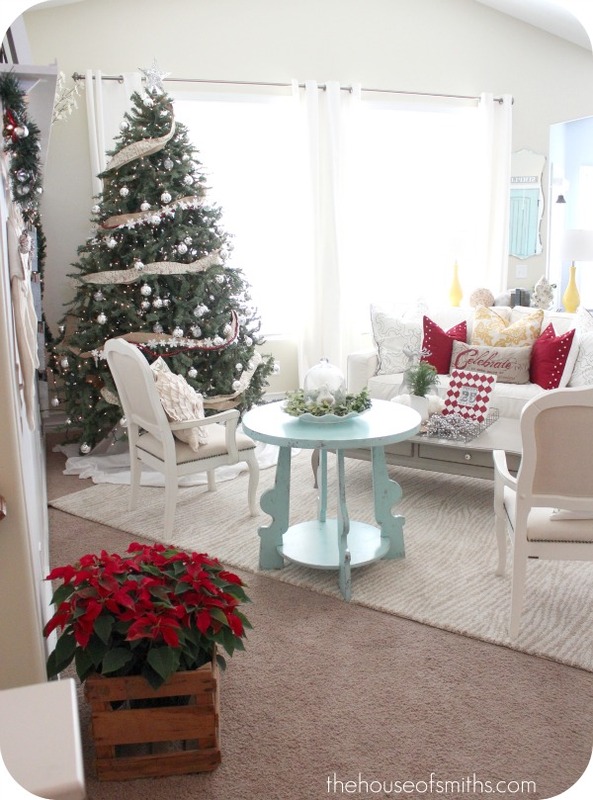 I love the warmth that red brings to a room, it just screams Christmas! 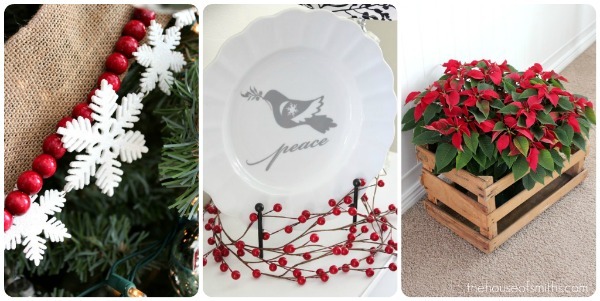 You can purchase the Dove/Peace decal and Jingle Bell lettering in our Design Shop. 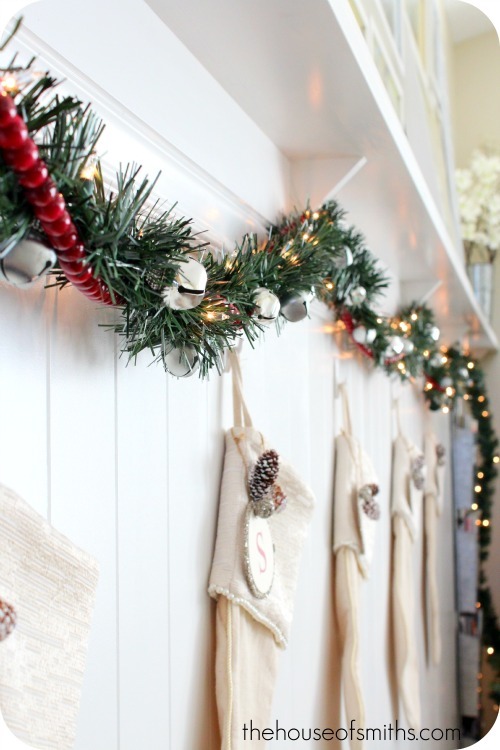 Of course we had to do another Christmas vignette in the kitchen too! And because you can't do a Christmas tree any justice in the day time... here is a shot of our simple, classy beauty at night, all lit up. Red scribe ribbon: Pottery Barn, Ornaments: Hobby Lobby, Star topper, red beads, white snowflakes and burlap ribbon: Tai Pan. So what do you think? 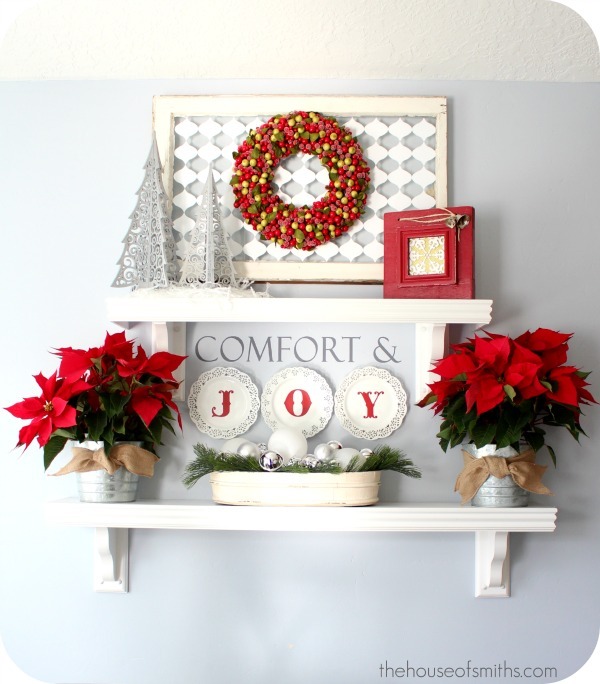 Do the reds and traditional touches, like the poinsettias, resonate Christmas memories to you, like they do to me!? 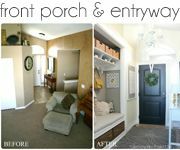 I guess the thing I love about decorating the most (especially for the holidays) is that, if you start out with a great canvas, you can work in any type of style, color and pattern into your space and just tweak it to make it your own! Plus, you can kind of go crazy and over-the-top if you want, because it's just for the holidays! ...and are YOU ready for Santa? 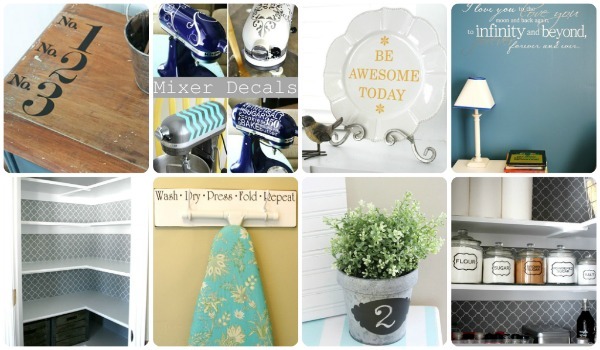 The House of Smiths Design Shop and stock up on everything you'll need! Yahoo! So stock up on gifts or goodies for yourself! I love everything about it - great job! It really is the most wonderful time of the year, isn't it? SUPER cute!!! I love how clean and classy it all looks! I love the splashes of red. The mini pointsettas on the shelves are so cute- love the pots! So beautiful! I want to move in! Seriously, could I just BE you? Please? For one day? 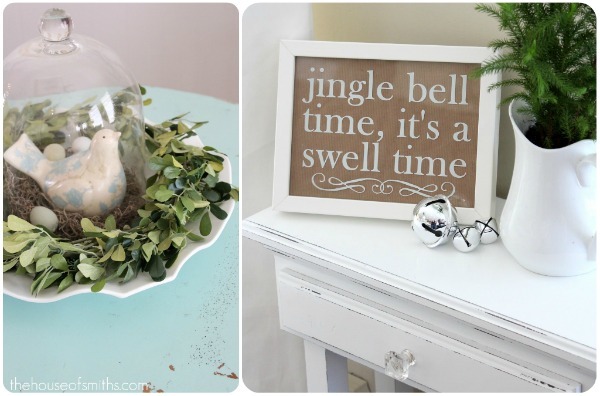 Your Christmas decor is amazing! It looks adorable! 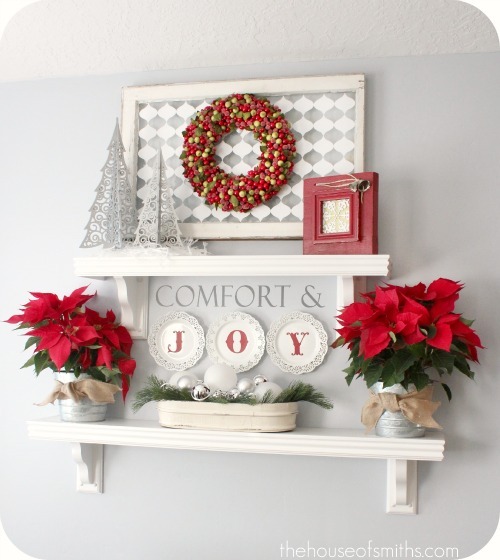 I love red and I love how you used it, and those poinsettias in the crate, loving it! You don't mind if I borrow that idea do ya? Oh and the window and frame, love that pattern! WOW!!! I LOVE IT! EVERYTHING you do is amazing! Your whole livingroom is just stunning!! Gorgeous, Shelley!!! Man I wish I had your decorating eye! You've got a gift girly! LOL! You are such a talent and stinkin' funny! 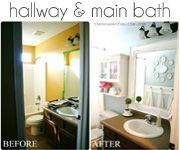 Your decor and home are gorgeous! And you sure rocked those poinsettias! I think I've pinned all of your kitchen shelf vignettes. I love how you decorate them for the holidays. 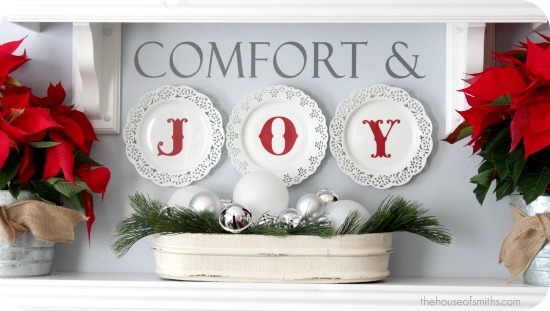 I'm adding this Christmas one to my Pinterest boards....love it! I totally love love love your house in Christmas-style. Here in the Netherlands the Christmas-spirit will start next week cause we have a 1 holiday to go before Christmas called Sinterklaas. 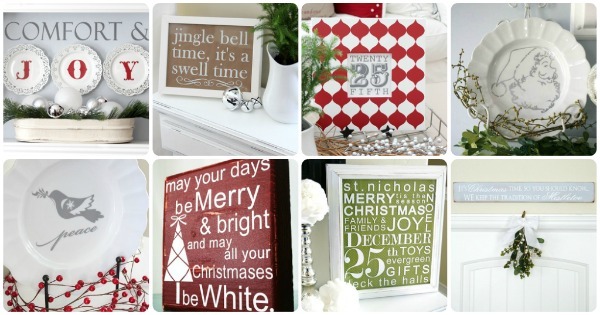 But I've allready my house totally in Christmas-style and also using the red and the whites. 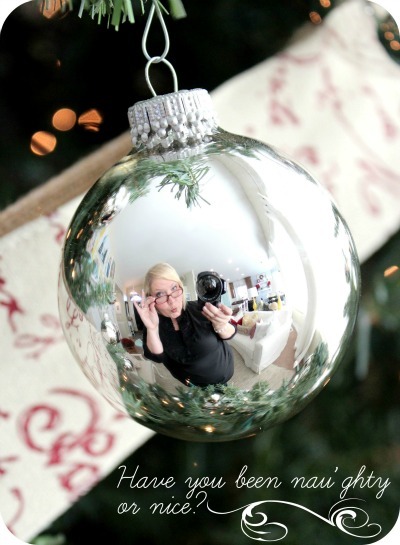 I'll link this post on my blog this friday at my inspiration-post over Christmas. Cause I think a lot of Dutch-woman would love your style like I do. So stinkin cute! I love it all! I love it!!! Your home is so beautiful and welcoming!! I love the red!! I decorate every year in red, I am a traditional girl, what can I say!! Merry Christmas!! Christmas isn't Christmas without lots of RED. Your home looks beautiful and cozy. Sure do wish I could decorate my home. 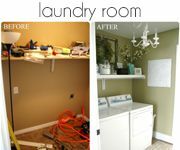 I have to wait until our renovation is over and it is killing me! 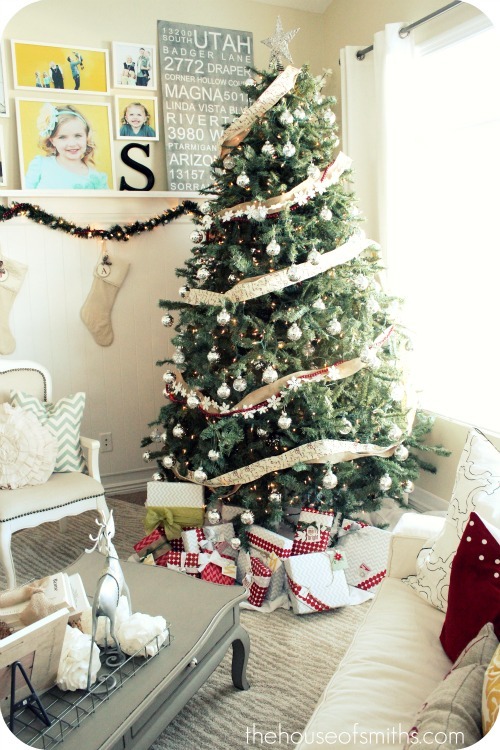 I love how you played up your Christmas tree with silver and the red, white & silver decor definitely gives the feel of Christmas. I'm a new follower, please drop by when you have a chance. Shelly it's absolutely beautiful!! LOVE it all - especially the pillows! Hope you and your family have a fabulous December! Love every single detail! LOVELY! gosh you are awesome!! love your stuff! Hi! But what if we don't have Tai Pan in our area, Arkansas??? 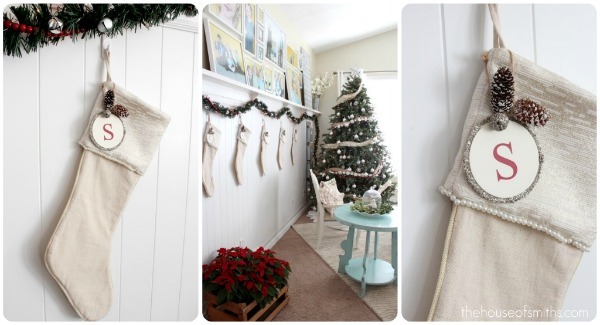 I want that burlap ribbon! It's so very hard to find. Do you sell in your shop? So want this for my tree. Any ideas? So beautiful! Can I move in? Absolutely beautiful Shelley! You did an amazing job. 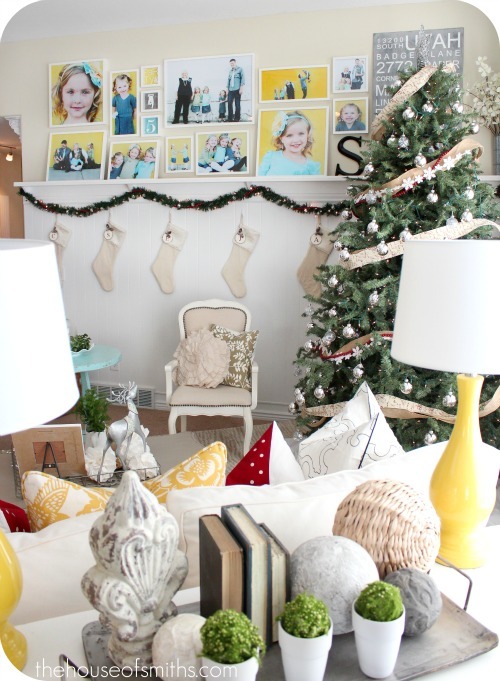 Love the pillows and your shelves this year! Lots of beautiful inspiration! And your photography is beautiful - as always. I've featured your blog today at Stylesson. Thanks for all of your creativity! Once again it looks beautiful....and I love the super nanny picture, YOU ARE DARLING! I am in love with your tree. I actually used your tree as an inspiration for mine with the ribbon. It's amazing what a little bit of ribbon can do for a tree. I noticed while I was shopping for Christmas things that tree skirts are quite pricey this year. Where did you get yours at? Gorgeous! Hate to say this but I think it's "Jingle bell time is a swell time to go riding in a one horse ..."
Everything looks amazing Shelley! I especially love the picture frame you fancied up and the pillows you made! I think I need to make a trip to Pottery Barn! I love your napkin pillows - they are so adorable! I really want to make some. Did you buy the napkins this year? I love everything you've done! Can I just come sit in your house for a while? It is so cheery and bright! Our Christmas decor is definitely lacking, but seeing your home definitely gave me a good dose of Christmas spirit! Love you guys!!! I LOOOOOOVE the color combo of that minty aqua and cherry red. TO DIE FOR. Love it all as always!!!! I love uniformed trees. They look absolutely gorgeous. I do have a question. 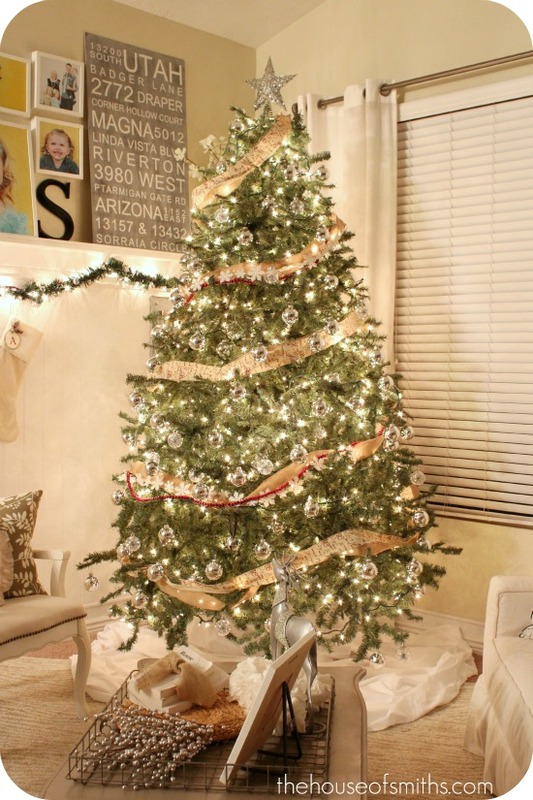 With a beautiful tree like that,do you have any ideas on what to do with the ornaments you get from your kids? They are adorable and I don't not want to use them, any suggestions? I've thought about doing a separate little tree (the kid's tree)??!!!! Oh my. I absolutely LOVE your eye for design. I have recreated/will be recreating a few of your tutorials in my own home. 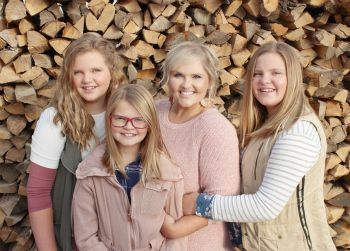 Anytime I feel like I need a bit of inspiration, I swing by The House of Smiths blog. This year's Christmas design is probably my favorite. Keep up the wonderful work!! I just came across your blog,you are amazing!! Great ideas!! Love it, I'm a fan !! Where is your tree skirt from? Or is it a diy? It varies depending upon the weather, which species where planted by the tree farms years ago, and your region of the country. In Florida, Red Cedar, Virginia Pine, Sand Pine, Spruce Pine and Leyland Cypress are grown specifically for use as Christmas trees. Very very pretty. I like the display by the mirror and the garland is very nice. Great photos. Looking so beautiful and Gorgeous!!! Merry Christmas and have a Joyful day!